Data is more critical than ever in all aspects of modern business. As more organizations embark on digital transformation and embrace a data-driven culture, a common IT challenge is building the definitive source of truth for trusted data, breaking infrastructure and functional silos and bringing all data types together. 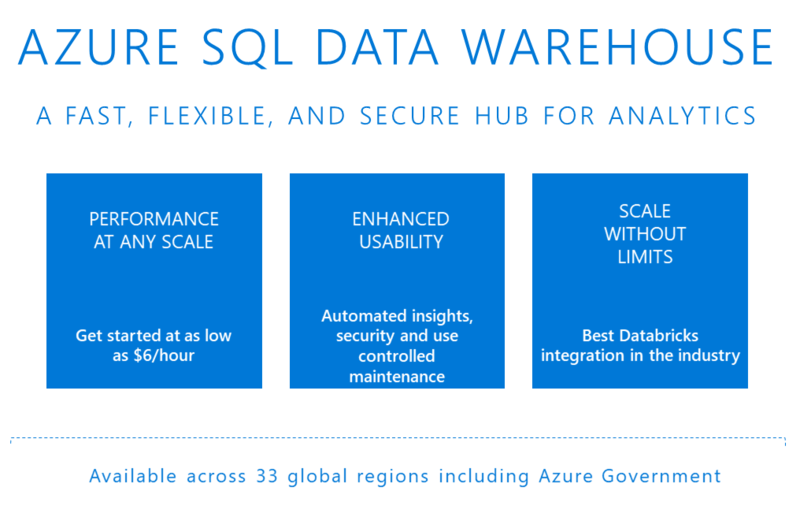 Thousands of customers are now using Azure SQL Data Warehouse (SQL DW) to take advantage of the fast, flexible, and secure analytics platform to gain deeper insights and make better decisions. Azure SQL DW has been engineered to deliver lighting fast query performance in a secure, cost-effective cloud solution. With the release of Compute Optimized Gen2 tier earlier this year, Azure SQL DW has set new industry standards for fastest query performance and highest query concurrency. We have been recognized as a leader in price/performance through TPC-H benchmarks for cloud data warehousing. To make this high-performance analytics platform more accessible, today we are announcing multiple service usability and security enhancements to allow our customers to build and manage an enterprise-grade data warehouse with ease. We are also excited to share our recognition as the leader in a recent TPC-DS performance benchmark research. 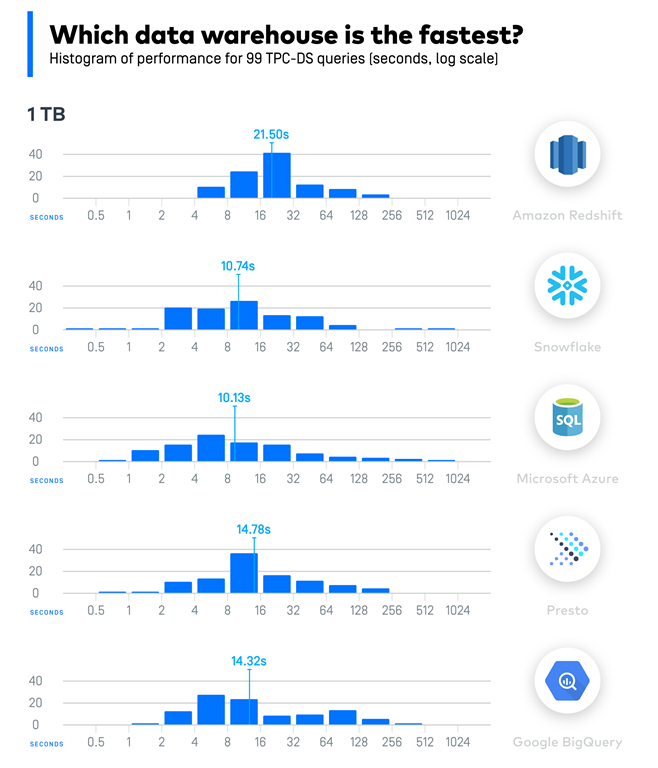 Fivetran, a data integration vendor, recently published a benchmark study where they measured five cloud data warehouses using the TPC-DS benchmark. Azure SQL DW was the fastest in processing 1 TB queries while delivering one of the lowest cost solutions. The TPC-DS decision support benchmark used by Fivetran focuses on queries that give answers to real-world business questions and executes queries of various operational requirements and complexities (e.g., ad-hoc, reporting, iterative OLAP, data mining). To ensure that customers of all sizes can benefit from SQL DW Compute Optimized Gen2 tier’s performance improvements, today we are announcing a new, smaller service level; DWU 500c. This service level is Generally Available to Azure customers today. Historically, data warehouses have required substantial investments to set up and operate. Customers can check the pricing page to quickly get started and use this new service. While delivering high performance, Azure SQL DW also takes away the complexity of running a cloud data warehouse. Customers can now choose a preferred maintenance window based on their business requirements, giving them the flexibility to select times when system maintenance is to be performed. With the general availability of Azure Data Studio, our customers can automatically render dashboard widgets to help surface tuning insights into their data warehouse. The SQL DW insights extension for Data Studio allows customers to seamlessly apply best practices when monitoring, managing and tuning your data warehouse. Continuously delivering on fully managed experiences, Azure SQL DW customers no longer need to monitor their data warehouse to detect data skew and suboptimal table statistics. With enhanced integration with Azure Advisor, customers will; get intelligent performance insights within the Azure portal and can create rich, customizable dashboard widgets. Finally, customers get enhanced data protection and recovery through accelerated and flexible restore points for their workloads. Customers also benefit from continuous monitoring of security and policy enforcement with SQL Vulnerability Assessment. This capability provides a comprehensive security report along with actionable remediation steps for each issue found, making it easy to proactively manage your database security stature even if you are not a security expert. This capability enables you to focus your attention on the highest impact actions you can take to improve your data warehouse security stature. For dynamic environments where changes are frequent and hard to track, SQL Vulnerability Assessment is invaluable in detecting the settings that can leave your data warehouse prone to attacks. To better serve customers with faster data insights, Azure SQL DW now allows you to build powerful real-time analytics solutions with the best Databricks integration in the industry. Customers can easily stream, train and publish streaming dataframes coming from IoT devices or web sources on Azure. With the tighter Azure Data Lake Storage Gen2 and Azure Databricks integration, we have significantly decreased the latency between data ingestion and insights by simplifying and speeding up trickle data ingestion supported by other data warehouses. This new functionality requires minimal changes in existing Spark Streaming implementations making it easy for existing code and skillsets to be used to integrate the two services. Azure is the best place for organizations to unlock the insights hidden in their data to accelerate innovation with solutions for their specific needs. Customers can benefit from a comprehensive platform offered by the Microsoft cloud including Power BI, Azure Databricks, Azure SQL Data Warehouse, Azure Data Factory, and other Azure services for building end to end analytics solutions efficiently and more economically.